Transnational cooperation, know as Interreg B, involves regions from several countries of the EU forming bigger areas. It aims to promote better cooperation and regional development within the Union by a joint approach to tackle common issues. Interreg B supports a wide range of project investment related to innovation, environment, accessibility, telecommunications, urban development etc. The transnational programmes add an important extra European dimension to regional development, developed from analysis at a European level, leading to agreed priorities and a coordinated strategic response. Sustainable urban development, especially polycentric development. 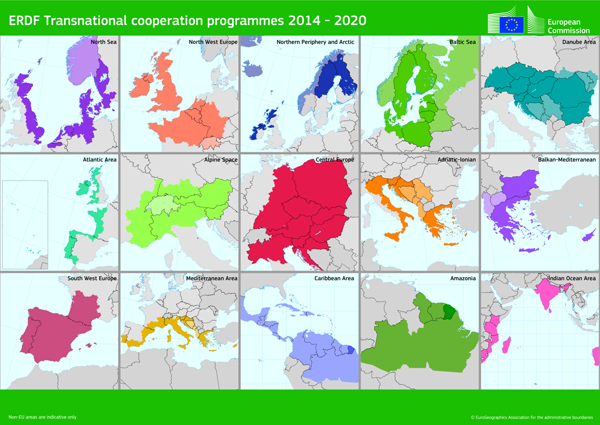 Interreg B covers 15 cooperation programmes. It is delivered through the European Regional Development Fund (ERDF) with EUR 2.1 billion for the period 2014-2020.